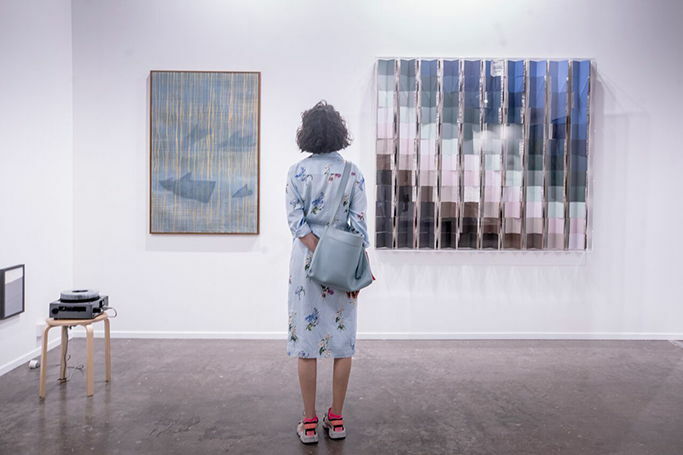 Over the weekend Dubai was at the centre of the art world as Art Dubai welcomed art lovers, galleries, curators and creatives from across the globe. The Madinat Jumeirah was taken over by international talent as themes of diversity and technology were prominent during Art Dubai 2018, with the Middle East’s art scene flourishing once more. The art fair also gave Instagrammers the opportunity to fill their feeds with vibrant canvases and candid head shots staring into amazing art. From huge geometric patterns to intricate prints, the event showcased a vast range of work from around the world for the public to admire and capture. A particular favourite was the ceramic doughnut wall installation by Jae Yong Kim –we loved the concept of art you want to eat! From the resident artists to Reframe Saudi’s virtual reality documentary film, the exhibition had plenty of wonders and a piece for every kind of art enthusiast.